If you have been missing having a dog or just want a little companionship….Come and walk with one of two beautiful yellow labs who have recently been certified as Therapy Dogs-this mean they have been trained and gone through classes with certified therapy instructors! Each Monday and Wednesday Chrys Cook, a next door neighbor of our community will bring one of her therapy dogs (Maddy or Scarlet) to take a walk with a small number of residents. We will meet in the Birch common area to start the walk. This would be a great way to get exercise and be with a pup, especially for those of you who miss having a dog but can’t because of logistics! PG13 2015 Drama…After emigrating from Ireland, Eillis Lacey readily adapts to the vastly different New York City, where she falls for a young Italian. But when tragedy pulls her back to her hometown, she finds her loyalties divided between two nations – and two men. No need to sign up. Just come and enjoy! Music and the movies have always gone together. Event silent films were accompanied by a live piano or organ-or even a small orchestra. Movies and music remain inseparable and some of the greatest melodies have been written to accompany the action on the silver screen. Join Active Minds as we explore this delightful genre. No prior musical or movie knowledge is required-only a curiosity and love of both. RSVP by Tuesday, July 3 to be a part of this event. Rated PG13….2017 Drama….The extraordinary true story of an unexpected friendship in the later years of Queen Victoria’s (Academy Award winner Judi Dench) remarkable rule. When Abdul Karim (Ali Fazal), a young clerk, travels from India to participate in the Queen’s Golden Jubilee, he is surprised to find favor with the Queen herself. As the Queen questions the constrictions of her long-held position, the two forge an unlikely and devoted alliance with a loyalty to one another that her household and inner circle all attempt to destroy. As the friendship deepens, the Queen begins to see a changing world through new eyes and joyfully reclaims her humanity. No need to sign up, just come over and enjoy! Don’t miss this extraordinary concert with Colorado Symphony! You will be treated to Conductor Christopher Dragon’s impeccable artistry as the most revered composer of all time is celebrated! They will perform highlights from concertos, operatic and symphonic repertoire. $35 will be charged to your account. **PLEASE DRESS APPROPRIATELY TO SIT OUTSIDE in covered seating. If you cancel and we cannot find a replacement, you will be responsible for $35. If you cancel within 24 hours of the event, you will also be responsible for a $5 cancellation fee; $10 if it is a 2 van event. Please sign up in the Birch dining room to be a part of this event. It’s that time again to go and enjoy a day out at the races! Arapahoe Racetrack is off of E470 in eastern Aurora and boasts a wonderful time watching and betting on your favorite horse! This is a great time to relax and enjoy a summer afternoon watching the world go by while you are in the comfort of an air-conditioned clubhouse close to all things necessary! All food is self-serve now, so you will order and pick up food and take it back to your table. Concessions offer burgers, chicken fingers, nachos and the like. There must be 10 signed up to go on this event. $4 will be charged to your account for a seat at a clubhouse table. If you would like a program, they are $3 at the door and all bets start at $2. Lunch is on your own. If you cancel and we cannot find a replacement, you will be responsible for $4. If you cancel within 24 hours of the event, you will also be responsible for a $5 cancellation fee; $10 if it is a 2-van event. Please sign up in the Birch dining room to be a part of this event. Don’t miss this great way to see Roxborough State Park…in a golf cart! You will ride with a guide for a one-hour-and-fifteen-minute tour through Roxborough State park. Along the way, you will see wildlife and learn about our native plants. ** Please bring water, sunscreen and a hat! ** $10 will be charged for the tour. Bus #2 will stop at a fast food place on the way home to grab lunch, please bring your wallet! There is very limited space on these tours (4 seats). If you cancel and we cannot find a replacement for you, you will be responsible for $10. If you cancel within 24 hours of the event, you will be responsible for a $5 cancellation fee. Please sign up in the Birch dining room to be a part of this event. Are you having problems seeing the menu in restaurants, reading your bills, making out checks??? You are NOT ALONE!!! Please join your friends and neighbors and Chris Kinney from the Colorado Center for the Blind in facilitating this support group! No RSVP needed to be a part of this event. Join us for a wonderful meal at a darling bistro in Aspen Grove! The menu consists of many omelet choices, egg breakfasts, Eggs Benedict, pancakes, crepes, French toast and much, much more! Come enjoy a meal with your friends and neighbors! Breakfast is on your own. If you cancel within 24 hours of the event, you will be responsible for a $5 cancellation fee; $10 if it is a 2 van event. Please sign up in the Birch dining room to be a part of this event. Come get your dance on with Risa! This fun, energizing class will teach you line dance steps to a variety of music, including The Electric Slide, Boot Scoot and Boogie, Slappin’ Leather, Tennessee Waltz, just to name a few. We will dance on the dance floor. WEAR SHOES THAT ARE SLICK ON THE BOTTOM, SUCH AS LOAFERS, COWBOY BOOTS, DANCE SHOES, BALLET SHOES (not tennis shoes). PLEASE BRING A BOTTLE OF WATER. No need to sign up…just come on over to the Event Center. Rated PG 2017 Drama….HIDDEN FIGURES is the incredible untold story of Katherine G. Johnson (Taraji P. Henson), Dorothy Vaughan (Octavia Spencer) and Mary Jackson (Janelle Monáe)-brilliant African-American women working at NASA, who served as the brains behind one of the greatest operations in history: the launch of astronaut John Glenn into orbit, a stunning achievement that restored the nation’s confidence, turned around the Space Race, and galvanized the world. The visionary trio crossed all gender and race lines to inspire generations to dream big. No need to sign up. Just come and enjoy! This will keep you feeling young and hip! Channeling a mix of rockabilly, country, and folk, singer/songwriter Rascal Martinez’s unique Americana-style roots music awakens memories of Jim Croce and early Bob Dylan. Join Rascal for an acoustic solo set of folk classics! $18 will be charged to your account. If you cancel and we cannot find a replacement, you will be responsible for $18. If you cancel within 24 hours of the event, you will also be responsible for a $5 cancellation fee; $10 if it is a 2 van event. Please sign up in the Birch dining room to be a part of this event. Don’t miss this wonderful evening outside in the fresh air on the Littleton History Museum’s grounds. The Random Notes will perform folk, bluegrass and Americana. There will be a food truck-Devil Dog Grill or you can pack a picnic dinner to enjoy. You MUST bring your own camp chair to sit in outside during the concert. This concert is FREE! If you cancel within 24 hours of this event, you will be responsible for a $5 cancellation fee; $10 if it is a 2-van event. Please sign up in the Birch dining room to be a part of this event. Come along and enjoy a homemade Italian meal at a neighborhood Trattoria. This small Italian restaurant will offer many favorites including black mussels, calamari, Stromboli, Chicken Parmagiana, Farfalle, Baked Shells, Baked Lasagna, Fettucini Alfredo, Chicken Marsala, Veal Parmagiana, Shrimp Scampi and much, much more! This will be a wonderful opportunity to find a gem right here in our neighborhood. Lunch is on your own. If you cancel within 24 hours of the event, you will be responsible for $5 cancellation fee; $10 if it is a 2 van event. Please peruse the menu in your building’ s book prior to signing up. Please sign up in the Birch dining room. It’s that time of year again!!! Our community BBQ will be catered by Bennett’s BBQ again this year! You will enjoy BBQ beef, pork and chicken along with great baked beans, potato salad and scrumptious brownies and cookies! Albert Galli will provide good old Dixieland Jazz for your enjoyment outdoors. Enjoy the summer afternoon with your friends and community! This BBQ is for Concordia residents only! (no family or friends). Seating for the BBQ will not be available until 11:00am, no earlier!! You MUST have a ticket to enjoy the BBQ!!!! There are no exceptions. TICKETS WILL BE DELIVERED TO YOUR APARTMENT/COTTAGE BY THE END OF BUSINESS DAY, WEDNESDAY, JULY 11. The Deadline to sign up is THURSDAY, JULY 5. The caterer has requested numbers by THURSDAY, JULY 5, so there will be no additions after that date. Those who choose seats outside will eat first! Rated PG-13…..2005 Drama…Through flashbacks and other nonlinear devices, director Richard Attenborough recounts comic icon Charlie Chaplin’s (Robert Downey, Jr.) poignant journey through triumph, failure, infamy and government persecution. The large cast of characters includes George Hayden (Anthony Hopkins), Douglas Fairbanks (Kevin Kline) and Chaplin’s mentally unbalanced mother (Geraldine Chaplin). Downey’s performance earned both Oscar and Golden Globe nominations. No need to sign up, just come and enjoy! Back by popular demand, join the Denver Brass and the 17th Avenue Allstars for “Good Vibrations” featuring classic hits worthy of any summer playlist! Come relive the magic of America’s golden age of rock through nostalgic sounds of the Beach Bos, Elvis, Earth Wind and Fire, the Beatles, Chicago, and more. Be sure not to miss this memorable evening outside at the Arvada Center in the amphitheater. **PLEASE DRESS APPROPRIATELY TO SIT OUTSIDE IN COVERED SEATING. $22.50 will be charged to your account for the concert. There are refreshments that will be sold there if you so choose. If you cancel and we cannot find a replacement, you will be responsible for $22.50. If you cancel within 24 hours of the event, you will be responsible for a $5 cancellation; $10 if it is a 2 van event. Please sign up in the Birch dining room to be a part of this event. Come along as we enjoy a wonderful Mexican lunch at one of Littleton’s yummiest restaurants! The menu consists of several different favorites including chili rellenos, burritos, tacos and much more! The menu includes many interesting choices for your lunch! Lunch is on your own. Please peruse the menu in your building’s book before you sign up. If you cancel within 24 hours of this event, you will be responsible for a $5 cancellation fee; $10 if it is a 2 van event. Please sign up in the Birch dining room to be a part of this event. Rated PG13….2005 Drama…The true story of one woman’s effort to keep her family afloat under difficult circumstances comes to the screen in this bittersweet comedy drama. Evelyn Ryan (Julianne Moore) was a woman of intelligence, talent, and pluck living in the small town of Defiance, OH, in the 1950s. Evelyn was married to Kelly Ryan (Woody Harrelson), a man who gave her ten children but not much else; Kelly had a severe drinking problem, struggled to hold on to a job, and tended to spend his money as soon as he earned it. It was seemingly up to Evelyn to support the family, but with ten kids to look after, taking a job outside the home hardly seemed practical. But the resourceful Evelyn discovered a way to bring some extra money into the household — at a time when a number of companies held contests to find new advertising jingles for their products, Evelyn had a genius for coming up with slogans and winning contests, and for the better part of a decade Evelyn kept food on the table and a roof over her head by dreaming up jingles, tag lines, and ad headlines and winning contests with her handiwork, often selling the merchandise she won to pay the bills. The Prize Winner of Defiance, Ohio was based on the best-selling memoir by Terry Ryan, who was the sixth of Evelyn Ryan’s ten kids.” No need to sign up, just come and enjoy! 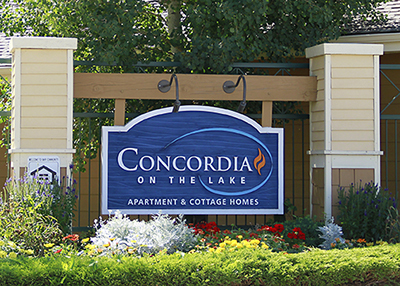 If you are a Cottage resident, please come to meet Mark Osweiler, Concordia’s General Manager! He will be in the Event Center to get to know each Cottage resident and answer any questions or concerns you may have. RSVP in the Birch on campus book to be a part of this event by Tuesday, July 17. Be sure not to miss this interesting evening of Bluegrass. Chain Station is a 4-piece, high energy, get ‘em out on the dance floor string band from Denver Colorado. Their music is well steeped in Americana roots, with vocal harmonies that are high, lonesome, and tight. Their picking ranges from lightning-fast to mountain mellow. They are a bluegrass band that would satisfy a picky ol-timer and delight fans of new bluegrass, a delicate balance indeed. We will be heading to outdoor Englewood Civic Center Amphitheater. You can either pack a picnic dinner or we will be dropping by Kentucky Fried Chicken to pick up dinner. You must drink a camp chair to sit on for this concert. This outdoor concert is free! If you cancel within 24 hours of this event, you will be responsible for a $5 cancellation fee: $10 if it is a 2 van event. Please sign up in the Birch dining room to be a part of this event. Get the girls together for a great day of shopping! Park Meadows Mall, Colorado’s original shopping “resort” includes JC Penney, Dillard’s, Macy’s, Nordstrom, Brighton, Bath and Body Works, Eddie Bauer and so many more! Lunch is on your own. If you cancel within 24 hours of the event, you will be responsible for a $5 cancellation fee. Please sign up in the Birch dining room to be a part of this event. Rated R….2017 Drama…When law enforcement fails to make headway on the months-long hunt for her daughter’s killer, Mildred Hayes (Frances McDermott) takes the drastic step of putting up three large billboards questioning the motivation of the town’s widely respected police chief. No need to sign up, just come and enjoy! The Arvada Center welcomes the Colorado Jazz Repertory Orchestra! This concert is entitled “Basie and Sinatra at the Sands” with singer Steve Lippia. Don’t miss this evening outside in the covered amphitheater, please dress accordingly. $35 will be charged to your account for this concert ticket. If you cancel and we cannot find a replacement, you will be responsible for $35. If you cancel within 24 hours of the event, you will be responsible for a $5 cancellation fee; $10 if it is a 2 van event. Please sign up in the Birch dining room to be a part of this event. Be sure not to miss this wonderful opportunity to see this beautiful part of Colorado. We will ride the Royal Gorge Route Railroad at the bottom of the Royal Gorge and along the Arkansas River. $65.00 will be charged to your account for the two hour train ride. There will be a grill onboard for you to order lunch.. They do not allow you to bring any food of your own onboard. If you cancel and we cannot find a replacement, you will be responsible for $65. If you cancel within 24 hours of the event, you will be responsible for a $5 cancellation fee; $10 if it is a 2 van event. This was a pre-sign up event. If you would like to be on the waitlist, please sign up in the Birch dining room. Come enjoy a summer morning out with the ladies! We will visit the Southglenn Snooze and enjoy wonderful pancakes, omelets, eggs benedict, and many more breakfast favorites!Breakfast is on your own. Please look at the menu in your building’s trip book to view the options before you sign up! If you cancel within 24 hours of the event, you will be responsible for a $5 cancellation fee; $10 if it is a 2-van event. Please sign up in the Birch dining room to be a part of this event. Rated…PG13…2002 Drama….Based on a true story, Frank W. Abagnale was employed as a doctor, a lawyer, and as a co-pilot for a major airline company-all before reaching his 21st birthday. A successful con artist and master of deception, Frank is also a brilliant forger, whose skill at check fraud has netted him millions of dollars in stolen funds–much to the chagrin of the authorities. FBI Agent Carl Hanratty has made it his prime mission to capture him and bring him to justice, however Frank is always one step ahead of Carl, baiting him to continue the chase. No need to sign up, just come and enjoy. Victor Hugo’s story, set against the backdrop of 19th century France, and put to music, Les Miserables is an unforgettable story of heartbreak, passion, and the resilience of the human spirit, that has become one of the most celebrated musicals in theatrical history. Don’t miss this wonderful opportunity to see an incredible Broadway show! $33 will be charged to your account for this ticket. This was a pre-sign up event. If you cancel and we cannot find a replacement, you will be responsible for $33. IF you cancel within 24 hours of the event, you will also be responsible for a $5 cancellation; $10 if it is a 2 van event. If you would like to be a part of the waitlist, please sign up in the Birch dining room. Don’t miss this! Calling all Denver natives and history buffs!!! We will be treated to a tour of parts of Denver that the mob ran above board and underground! Tom Hack, historian, will share stories that will seem like tall tales, but are true as true can be! You will even get a tour of the basement (there are stairs to the basement) of Gaetano’s restaurant where many big name gangsters met and made plans! After, we will get to eat lunch at Gaetano’s, one of Denver’s oldest, family-owned real Italian restaurants! ** Event if you were put on the waitlist last month, you MUST sign up again telling Risa you are interested in this outing on the new date! You will not just be put on the list! **$15 will be charged to your account for the tour. Lunch is on your own-paid by CASH ONLY! Please peruse the menu in your building’s book prior to signing up. If you cancel and we cannot find a replacement, you will be responsible for $15. If you cancel within 24 hours of the event, you will also be responsible for a $5 cancellation fee; $10 if it is a 2 van event. Please sign up in the Birch dining room to be a part of this event. Don’t miss this phenomenal accapella group from Boulder! Face is an internationally acclaimed all-vocal rock band from Boulder, CO with infectious energy, punctuated by an endearing love of performance. Pack a picnic dinner or we will stop by Kentucky Fired Chicken. YOU MUST BRING A CAMP CHAIR TO SIT ON FOR THIS OUTDOOR CONCERT! If you cancel within 24 hours of the event, you will be responsible for a $5 cancellation fee; $10 if it is a 2 van event. Please sign up in the Birch dining room to be a part of this event. Rated PG-13…2014….During the winter of 1952, British authorities entered the home of mathematician, cryptanalyst and war hero Alan Turing (Benedict Cumberbatch) to investigate a reported burglary. They instead ended up arresting Turing himself on charges of ‘gross indecency’, an accusation that would lead to his devastating conviction for the criminal offense of homosexuality – little did officials know, they were actually incriminating the pioneer of modern-day computing. Famously leading a motley group of scholars, linguists, chess champions and intelligence officers, he was credited with cracking the so-called unbreakable codes of Germany’s World War II Enigma machine. An intense and haunting portrayal of a brilliant, complicated man, THE IMITATION GAME follows a genius who under nail-biting pressure helped to shorten the war and, in turn, save thousands of lives. (c) Weinstein No need to sign up, just come and enjoy! Don’t miss this opportunity to spend time with friends and neighbors while enjoying some treats! Come and unwind in the company of old friends and new! This is a great way to meet people in the community! Come join in the fun!! Please RSVP in your building’s book to be a part of this event by Wednesday, July 25. Il Trovatore is known for some of the most glorious music Verdi ever composed. The intense story weaves a tale of passion, jealousy, and vengeance surrounding Count di Luna and the gypsy Azucena, who has sworn her revenge on the di Luna family. Singers have risen to greatness performing this operatic masterpiece. We will enjoy our annual lunch presented by Chef Brian Cook prior to this wonderful opera! $70 will be charged to your account for the opera and lunch. If you cancel and we cannot find a replacement, you will be responsible for $70. If you cancel within 24 hours of the event, you will also be responsible for a $5 cancellation fee; $10 if it is a 2 van event. Please sign up in the Birch dining room to be a part of this event. Come and enjoy this travelogue of a beautiful part of our southwest region…Moab: Arches, Canyonlands and Dead Horse Point. Chris will share beautiful pictures and stories of the area. Be sure not to miss this beautiful presentation! RSVP to be a part of this event by Friday, July, 27. We will be going to the Denver Rescue Mission where we will serve meals from 4:00-8:00pm. Please only sign up if you are planning on attending and can handle standing and moving around for 3 plus hours. There will not be places to sit and rest, it will be constant motion. Rated PG3…2017 Comedy Drama Science Fiction and Fantasy…. A contemporary fairy tale revolving around the unlikely of friendship between a reclusive young woman with dreams of being a children’s book author and a cantankerous widower, set against the backdrop of a beautiful garden in the heart of London. Bella Brown (Jessica Brown Findlay) is a beautifully quirky young woman who dreams of writing and illustrating a successful children’s book. When she is forced by her landlord to deal with her neglected garden or face eviction, she meets her nemesis, match and mentor in Alfie Stephenson (Tom Wilkinson), a grumpy, loveless, rich old man who lives next door and happens to be an amazing horticulturalist. No need to sign up, just come and enjoy! Join us for a scrumptious dinner from down under! Great steaks, pork chops, salmon, chicken dishes await!! Dinner is on your own. Please peruse the menu in your building’s book before you sign up. There must be 10 signed up to go on this event. If you cancel within 24 hours of the event, you will be responsible for a cancellation fee of $5; $10 if it is a 2 van event. Please sign up in the Birch dining room to be a part of this event.